As department store anchors sink, will grocery stores fill the void? March 21, 2017, 8:57 a.m.
As a Spencer Gifts-ogling child of the 1980s and Hot Topic-frequenting teenager of the 1990s, I can tell you in all confidence that shopping for groceries at the mall was never, ever a thing. Like a top from Talbots paired with accessories from Wet Seal, they just didn’t mix. Trips to the mall that involved food meant only three things for this mom-chaperoned kid: lunch at either the second-floor café at Nordstrom; the weird luncheonette in the basement of The Bon Marché; or a rare excursion to Orange Julius for a hot dog fries and sickly sweet strawberry drink. The mall where all this food consumption — but not shopping — took place was the Tacoma Mall, a sprawling, single-level modernist retail destination designed by John Graham Jr., the same architect responsible for the Space Needle (along with Victor Steinbrueck) and Seattle's Northgate Mall, the first modern suburban "shopping mall" in the United States, which opened in 1950. Food shopping almost exclusively took place miles away at the neighborhood Safeway supermarket. Even today, the notion of a major supermarket replacing a traditional, mall-anchoring department store still doesn't quite register, even though much of the Tacoma Mall — remaining anchor stores, included — has been remodeled, expanded or demolished. None of these mall-anchoring department stores, however, have yet to be converted into a supermarket. J.C. Penney and Sears, two once-mighty anchors, are still in their original locations. Macy's, for now at least, is still in the old Bon Marché building, which opened a full year before the rest of the Tacoma Mall in 1964. But will this change as once seemingly invincible department store behemoths continue to languish and leave vast, gaping retail holes in their place? Can supermarkets save dying shopping malls as retailers like Macy’s (which has 68 store closures slated for 2017) and J.C. Penney (138 store closures slated for 2017) continue to shutter stores at a record speed? Perhaps it will and perhaps they can. Writing for The Washington Post, Thomas Heath recently explored the seemingly incongruous (at least to children of the 1980s and '90s like myself) trend of opening grocery stores in the old anchor stores of regional enclosed shopping malls — a trend that's not entirely new but has become increasingly common over the past couple years. And apparently, the presence of a large grocery store can turn around the fortunes of on-life-support suburban shopping malls as shoppers continue to gravitate toward online retailers like Amazon.com and, in the case of my hometown, revitalized downtown retail cores. Ordan notes that, despite largely being an anomaly in the United States for the past several decades, shopping malls are kind of perfect match for supermarkets: When taking over the spaces left behind by department store anchors, there’s usually more than enough square footage to go wild with new concepts along with a ton of built-in parking and increased visibility. “It makes it very attractive for the tenant,” Ordan says. While reviving failing malls by inserting grocery stores into defunct department stores is new-ish, shopping malls and grocery stores aren't historically an aberration. A decent number of 60s-era malls were originally built to include grocery stores as anchors although that trend faded away by the 1980s. 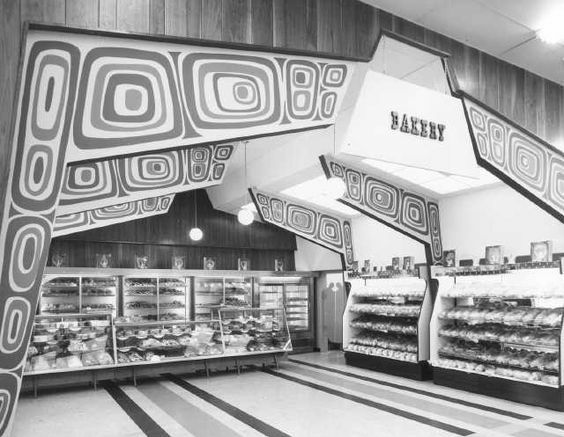 Even the Tacoma mall had a delightful-looking Thriftway Supermarket until it was shuttered and replaced by a food court circa 1986. Today as Tom McGee of the International Council of Shopping Centers explains to the Post, there’s the added one-stop-shopping appeal for millennials who would prefer, for efficiency’s sake, that supermarkets and shopping malls not be segregated. “Part of it is convenience, the ability to do things in one location. Millennials value convenience,” says McGee. The Post goes on to give several examples of flailing regional shopping malls that have been given a jump-start with the addition of supermarkets. In a space once populated by J.C. Penney (previously Macy’s and before that, Jordan March) at the Natick Mall outside of Boston, there will soon be an outpost of Wegmans, the Rochester, New York-based grocer with incredibly happy employees and a considerable cult following. At Kingsdale Shopping Center — home to the original outpost of fallen mall fashion staple, The Limited — In the suburbs of Columbus, Ohio, a sprawling anchor space that once housed a Macy’s is now owned by Kroger (much to the chagrin of supermarket chain Giant Eagle, which also operates a store in the vicinity). Instances of demolition/rebuilding aside, this all seems a fine example of blight-dodging mall reuse. Why construct an entire new grocery store when you can move one into an existing space that might potentially sit vacant for years, dragging down the rest of an already-beleaguered shopping mall with it? Considering that roughly one third of America's 1,200 enclosed shopping malls are dead or dying, it almost seems the charitable thing to do. But what good is a supermarket when the rest of the mall is dying? Despite a trend that would suggest otherwise, some retail experts claim that the ideal locale for supermarkets aren’t the spaces left vacant by defunct and dying shopping mall anchor stores as Ordan, McGee and Caldwell suggest. In fact, neighborhood strip malls still rule when it comes to supermarkets. The disadvantage is that grocery anchors don’t do what traditional mall anchors do. They don’t bring people to shop in the rest of the mall in the same numbers, since you don’t start at Wegmans, then lug your groceries through the rest of the mall. Even as a kid this was largely true: Trips to the mall almost always started or ended with the compulsory trip to a department store anchor for back-to-school clothes or whatnot followed by everything else: Waldenbooks, Camelot Music, See’s Candy, etc. “It's a fine line how this strategy is implemented,” Thomas Dobrowski, executive managing director of capital markets at real estate services firm Newmark Grubb Knight Frank, tells the Wall Street Journal in a business trend piece on the rise of supermarkets as shopping mall anchors. “The addition of a grocery anchor is not necessarily complementary to the other stores, particularly fashion retailers." Has a supermarket taken the place of a traditional department store anchor at your local shopping mall? Have you made grocery shopping part of your mall-going experience or do you continue to keep these two retail experiences separate? As department store anchors sink, will grocery stores located in malls become the new normal?